The Minneapolis and St. Paul areas often experience harsh weather. We’re lucky that we don’t have to deal with major flooding and the resulting structural damage. But, we do have high winds, hail, tornadoes, lightning and extreme temperature fluctuations. All these can cause storm damage, especially to your roofing system. Some of the most common types of storm damage include displaced asphalt tiles, broken clay or concrete tiles, stripped roofing, leaks from rainwater, lightning damage, hail damage and destruction from a fallen branch or other debris. All of these issues can expose your home to the dangers of water damage. It can do more than stain your walls and cause puddles in your living room. It can also lead to events like dangerous electrical fires! So, if your home gets damaged, protect its structural integrity. Call your trusted roofing repair contractors, Krech Exteriors. Prevention is better than cure. So, prepare yourself and your roof with the following precautions. Learn what’s covered in your insurance policy so you can prepare your budget. Focus on parts of your roof that may need extra protection if they’re not covered. Krech Exteriors can help with your insurance claims. Your roofing system can block rainwater, but what if you have clogged gutters? They can cause the runoff to overflow and seep through the roof eaves. Keep debris from blocking your gutters and downspouts. Krech Exteriors provides seamless gutter fabrication and installation to prevent water leaks. Overhanging tree branches shed a lot of leaves on your roof that can block your gutters. Strong winds can also knock them off and cause severe impact damage to the roof’s surface. Trim them before a storm hits, and check for other sources of debris that wind can blow straight into your home. Preparing for storm damage starts as early as installation. High-quality shingles provide better resistance against storm damage. Choose shingles that pass both UL 2218 and class 4 rating impact tests. Krech Exteriors is a GAF Master Elite® contractor and offers only quality shingles. 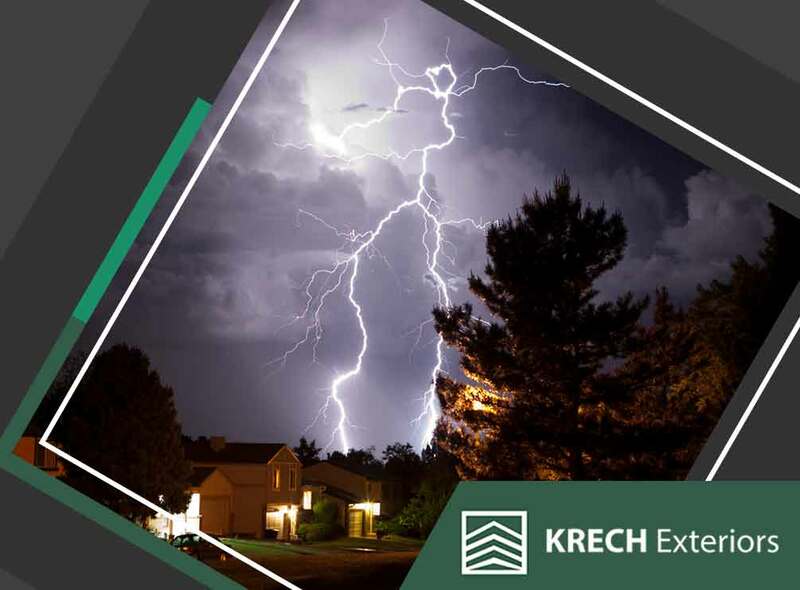 So, when disaster strikes and your home is affected, be sure to call Krech Exteriors. Our crew will immediately repair or replace your Minneapolis and St. Paul roofing. Give us a call at (651) 968-8888 for a free in-home consultation.